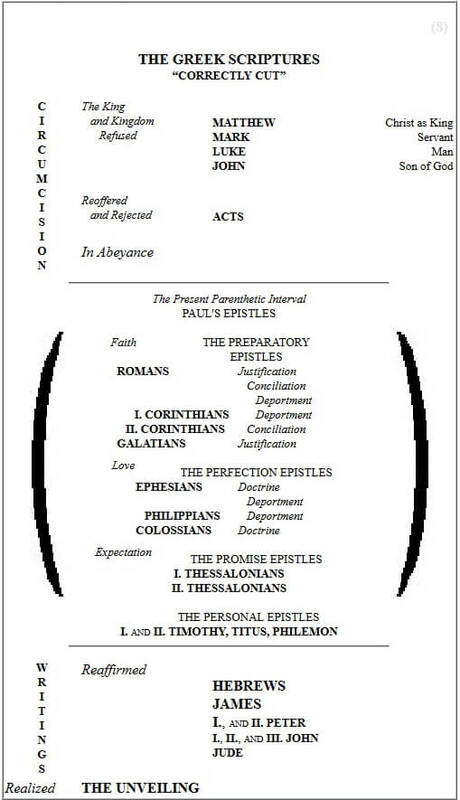 The outline shown above will give a grasp of the Greek Scriptures at a glance. CHRIST and His kingdom occupies the place of prominence in the Greek Scriptures. They chronicle its refusal when proclaimed by the King Himself, its rejection when heralded by His apostles after His resurrection, its present abeyance, its reaffirmation and realization in the days to come. Only Paul's epistles, from Romans to Philemon, are written to, or intended for, the Uncircumcision. While all blessing for the nations was planned to come through the sons of Israel, this channel is choked when they reject the testimony of the apostles, as recorded in the book of Acts. All blessing for the present is based on their apostasy, and comes to us, not through them, but through their defection, and is limited to the period of their rejection. Furthermore, the destiny in Paul's epistles is different. The Circumcision and their beneficiaries are blessed on earth. The Uncircumcision of this economy are blessed among the celestials. This book is not the “New Testament” or covenant. The new covenant which Jehovah will make with His people Israel is to be formed in the so-called “Old Testament” (Jer.31:31-34), and is repeated in the “New” (Heb.8:8-13). In both cases it is confined to the physical seed of Jacob, the same people who received the old covenant at Sinai, and its place is in the coming kingdom. The grand division in God's purpose is not between these two covenants, but rather between covenanted and uncovenanted blessings. The nations or gentiles will share some of Israel's good things when they are in favor once again, and are under the new covenant. But in the great parenthetic period between their past apostasy and future fullness we have the present grace. This is made known only in Paul's epistles and is entirely distinct from the message of the scriptures to the Circumcision. We have enclosed Paul's writings in a parenthesis to indicate that they are an interlude. The great movements inaugurated in the Hebrew Scriptures are continued in the accounts of our Lord's life, in Acts, and in Hebrews, James, Peter, John and Jude, and especially in the Unveiling. But Paul's epistles reveal a secret purpose which antedates and transcends God's counsels for the earth and the blessing which comes through them is based on grace so pure and unadulterated that it depends for its display on Israel's failure rather than their faithfulness. Hence the same thread of thought can be traced through all the scriptures, omitting Paul's revelations, and they form a complete system, suited to the regeneration of the earth, through Israel. But Paul has a higher mission. He is concerned with the heavens and their reconciliation to God.